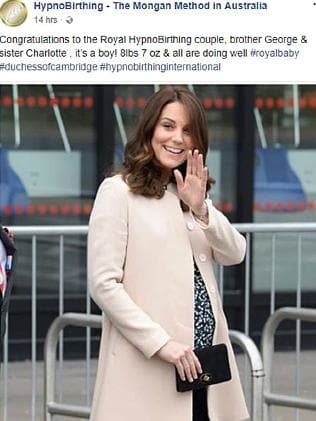 CATHERINE, the Duchess of Cambridge, is a hypnobirther who uses techniques including self-hypnosis and visualisation during labour, leaving her ready to appear before the world’s media looking fresh faced and camera ready just seven hours after giving birth. The Courier-Mailcan reveal the HypnoBirthing International Institute has confirmed that Catherine trained in its techniques and has used them during labour. It comes as Arthur remains the red-hot favourite for the new royal baby’s name, expected to be revealed by Prince William and Catherine as soon as today. 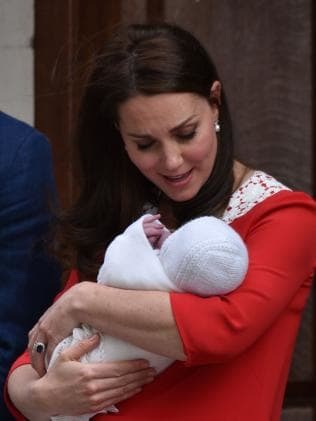 HypnoBirthing International vice-president Vivian Keeler said the royal couple used the program for their first two births and understands that the techniques would have been used during the birth of their third child. The Mongan Method is designed to allow the mother to feel connected to her body, her baby and partner. HypnoBirthing International Australian faculty member Anthea Thomas said the birthing technique would explain Catherine’s relaxed appearance so soon after her son’s birth. “Once a hypnobirther always a hypnobirther. Once you have learned the techniques you don’t forget them and continue them into subsequent births,” she said. “I believe that the royal couple had the normal five sessions in a private setting. Ms Thomas said Prince William would have played an important role in the birth. “Partners are taught to act as advocates and lead mum in voice and touch. They know the right questions to ask and how to stay calm,” she said. Congratulations were yesterday pouring in from across the globe with everyone from British Prime Minister Theresa May to US talk show host Ellen DeGeneres sending their best wishes to William and Catherine. UK bookmakers were still taking bets last night on what the new baby’s name will be, with Arthur the favourite across all major agencies. Albert, James, Philip, Thomas and Edward were also top picks with Catherine and William expected to chose a traditional name that has ties to the royal family. Commentator Richard Fitzwilliams said it was expected the couple “consulted with the Queen” before choosing the name. “Arthur is the name I suspect they will choose because of the legendary mythical King Arthur who was linked to the round table,” he said. Mr Fitzwilliams said Albert could also be chosen as a tribute to both Queen Victoria’s husband and the Queen’s own father, whose first name was Albert but went by George when he took the throne. Prince George and Princess Charlotte’s names were both announced within two days of their births. When leaving the Lindo Ward yesterday Prince William told reporters “you’ll find out soon enough” when asked about the name. Holding up three fingers he joke “thrice the worry now”, adding that the couple were “very happy, delighted”. As the UK celebrated the arrival of the baby prince, London’s landmarks were lit in celebration, with the famous Tower Bridge and the Golden Jubilee Bridge turned blue. The BT Tower projected the words “it’s a boy” across the top of the tower, and the London Eye was illuminated in the colours of the Union Jack. Wearing a red Jenny Packham dress, the Duchess yesterday channelled the outfit Princess Diana wore when she stood on the same steps in 1984 to introduce Prince Harry to the world. Prince William and Catherine appeared relaxed as they showed off their sleeping son to the world’s media and hundreds of adoring fans. The new baby is fifth in line to the throne, knocking Prince Harry down to sixth spot. But Princess Charlotte will not lose her spot as fourth in line due to the baby’s gender as the Royal Succession Act was changed in 2013.